Cape Coral has about 335 days of sunshine per year. The other days have changing clouds, thriving green all year round. The temperature of Cape Coral / Fort Myers is subtropical Spring (Feb-May) sunny with occasional showers. The temperature varies between 20-30 C degrees. Summer (May-September), sunny with no evening burst. 25-35 C degrees. Autumn (Oct-Nov), sunny, 20-30 C degrees. Winter (Dec.-Jan) sunny, daylight. 20-25 C, a little cooler at night. A few days with a little colder weather and clouds. 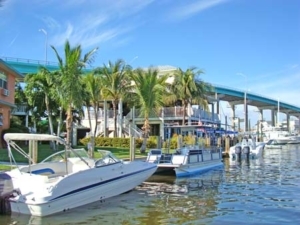 Cape Coral is an extremely lively and friendly hometown for Americans and guests from Europe. With over 600 km of channels, the city is a living boat landscape with the car on one side of the house and the boat on the other and with just minutes out on the Gulf of Mexico. Cape Coral has grown into the largest city in southwest Florida with over 100,000 inhabitants. All service is well developed and you lack nothing. Cape Coral has been ranked for several consecutive years as one of America’s top security and least-crime cities. 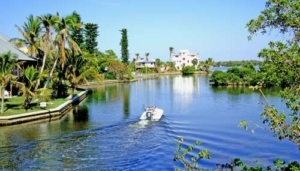 Cape Coral is a villa town lined with palm trees and canals. 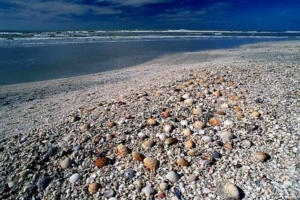 Whether you want a fast-paced and enjoyable holiday or just relax on the miles of beaches and pick shells on Sanibel, Cape Coral is the right place. The entire coastal municipality is free from factories and industries. Sanibel peaks before the Caribbean and Bali The industry shakes when America’s most acclaimed travel writer, Arthur Frommer, presents his list of the ten places he wants to visit in the world. Sanibel Island tops the 2012 list with the justification: An idyllic dream of white sand and beaches, first-class restaurants and popular shopping. Darlings Wildlife Refuge that is visited by all known bird species, dives for fish and dries the wings in the evening sun is a sight that is only found on Sanibel Island. Sanibel Island is still unknown to many, but the idyll is about to become a destination for romance and weddings. Frommer who is a respected name in several parts of the world has presented his charts since the 1960s.